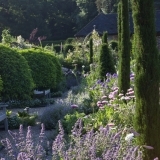 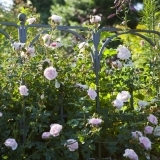 The owners asked us to restore a walled garden that would appeal to all the senses. 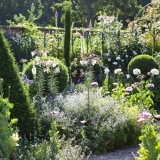 In the potager area, nearest the house, our garden design included borders with a wide range of ‘cottage garden’ perennial flowers contained within a strong evergreen framework of traditional box, yew and topiary. 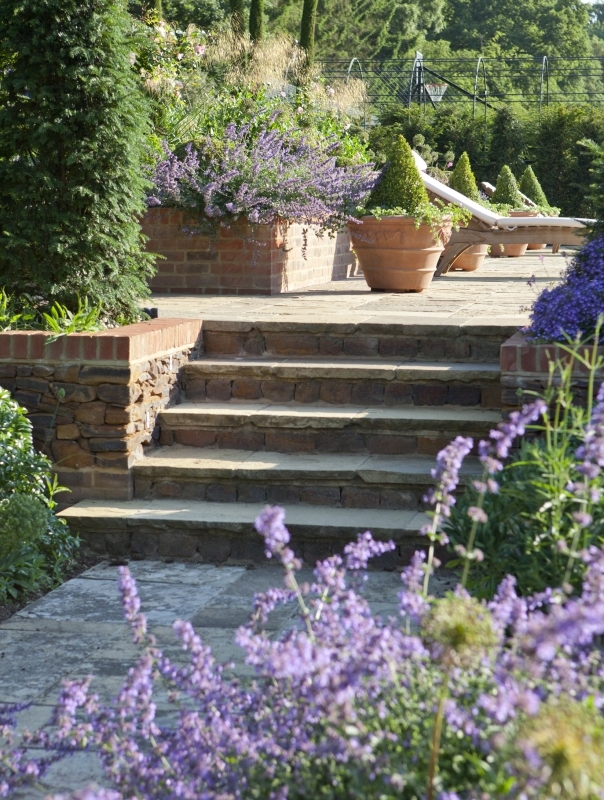 Down a flight of steps is the arbour, where our garden design sympathetically combines simple green lawns with custom-made ironwork and seating to create a peaceful place in which to escape with a good book. 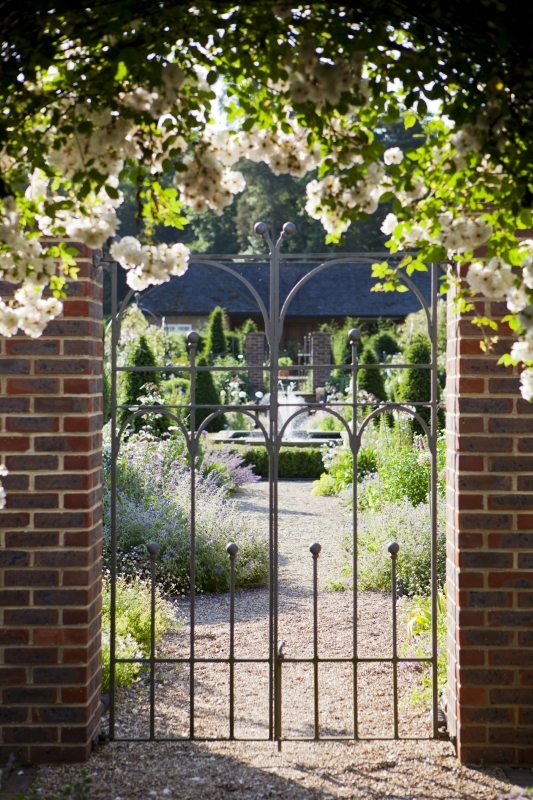 More steps descend to the water garden, which adds gentle, relaxing sounds as well as visual interest to the garden design; a side-gate gives access to a traditional greenhouse and kitchen garden area, reflecting the site’s origins and heritage. 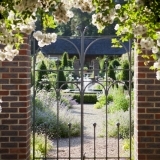 A 28-metre pergola, covered with white roses and filled with heady scent in summer, leads to a secluded swimming pool garden. 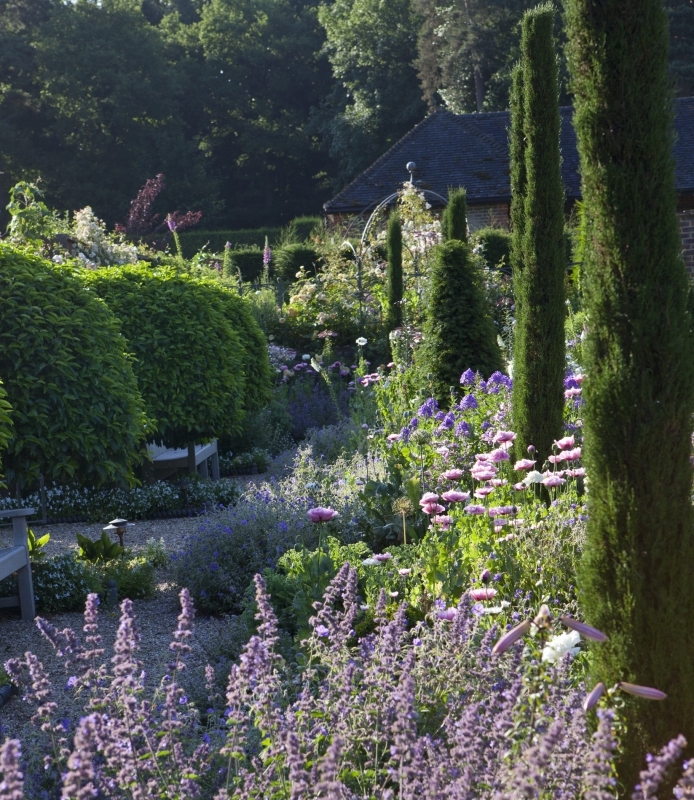 Surrounded by tall yew hedges for privacy, and equipped with crafted oak recliners, armchairs and a custom-made bench, this is an elegant, generously-proportioned space where our clients can entertain their international guests, or relax with friends and family. 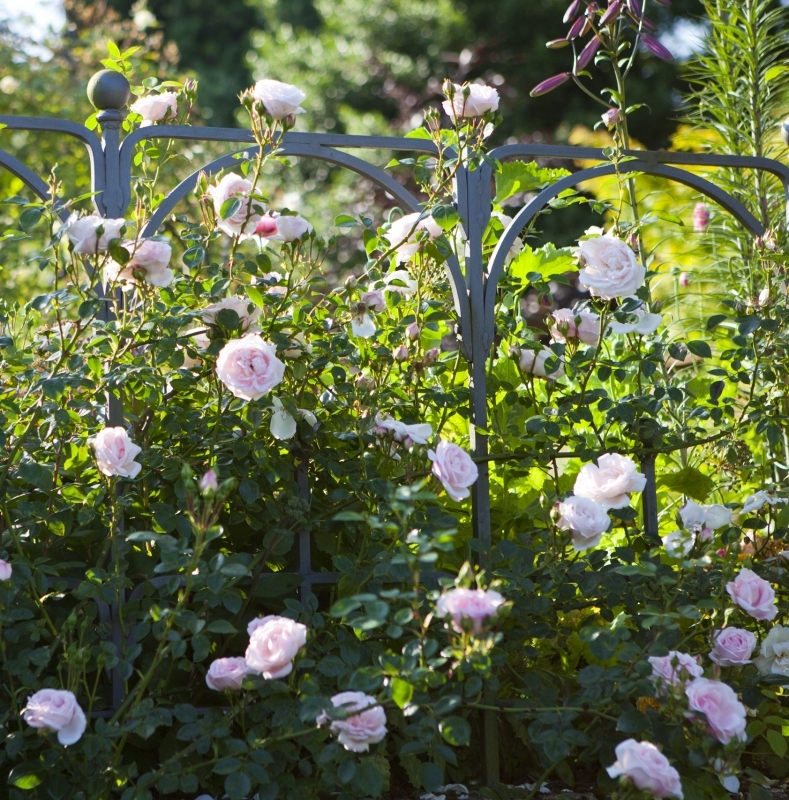 Planting is in raised beds and large Italian terracotta planters: bulbs, perennial hydrangeas, standard roses, box topiary and cypresses create different layers and textures, and give colour and perfume all summer long. 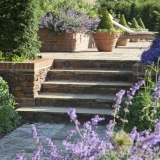 A loggia and Orangery give onto the pool area down a wide sweep of steps. 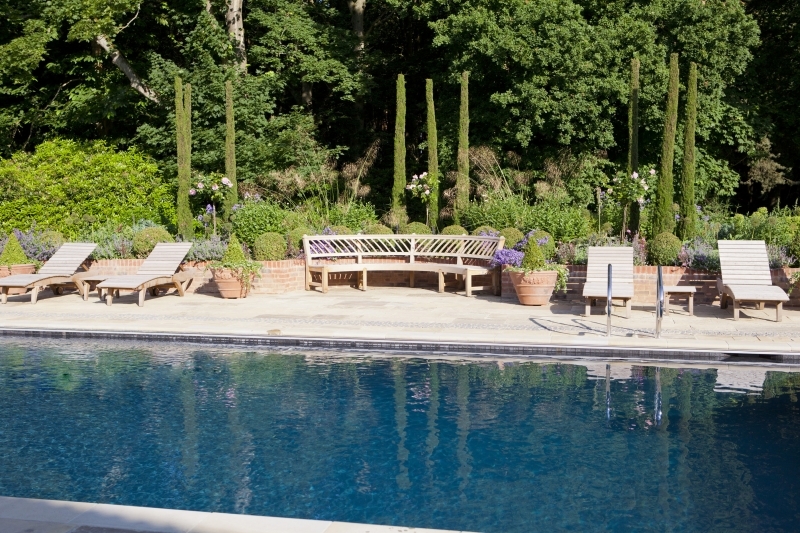 The pool itself, surrounded by paving and cobbles, is unusually large, deep enough for diving, and a rich, mysterious blue that perfectly complements soft English light – a gift for the garden designer. 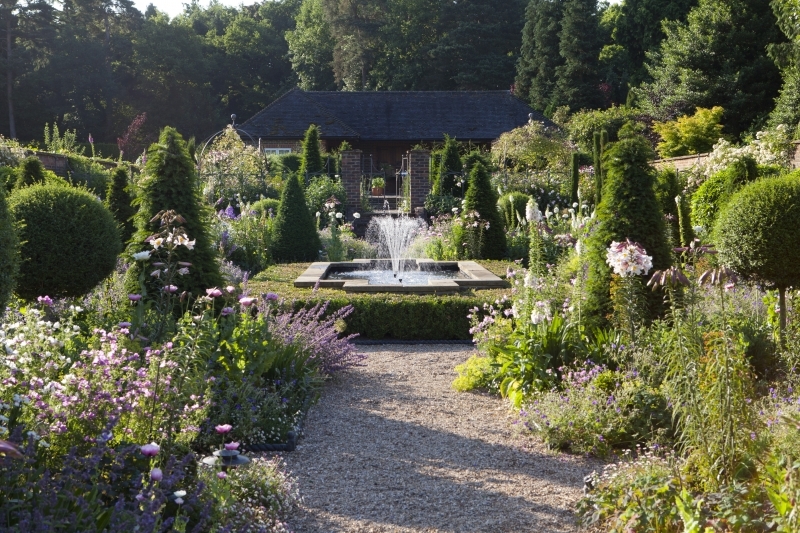 A separate yew enclosure conceals a Jacuzzi, surrounded by perfumed plants. 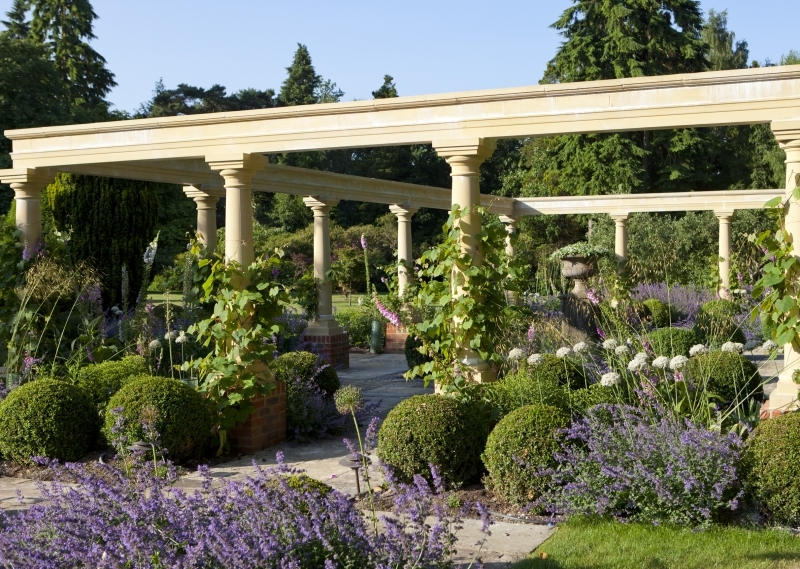 Beyond, the classical Italian Garden features stone columns on brick plinths wreathed in vines, enclosing paths to the pool, woodland, orchard and house, and sitting areas paved in old York stone. 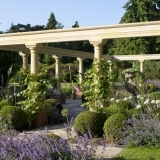 Set against woodland, these architectural structures create a pleasing contrast between the natural and the man-made worlds within the garden design. 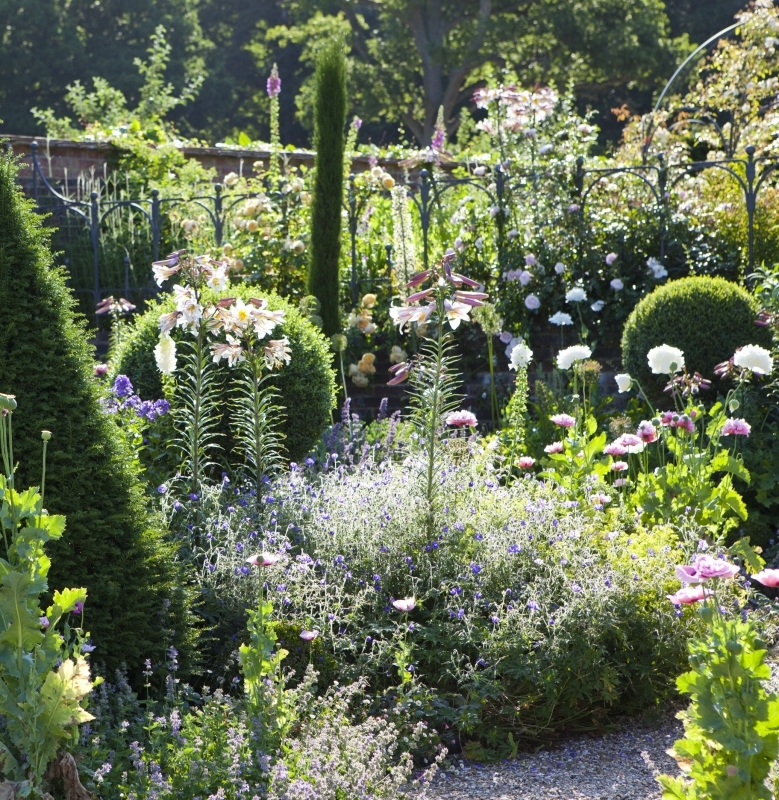 This theme is echoed in the planting, with cypresses, box, yew, perennials, roses and bulbs in arrangements inspired by wall paintings at Pompeii. 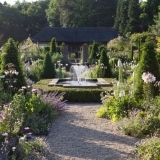 An enclosed, quiet space, it provides an intimate meeting-point for the garden’s different elements, and a peaceful contrast to the activity of the pool area.